View the full list of 2019 winning entries >>. The Junior Duck Stamp (JDS), a program for K-12 students, integrates wildlife and nature education with a visual arts curriculum. Students learn the importance of wetlands and waterfowl and use their knowledge to create a drawing or painting of one of the 46 native species of ducks, geese and swans and compete for a big prize: a commemorative federal stamp. The Junior Duck Stamp program is also a great opportunity for students to get out and explore wildlife for themselves. To arrange an outing to a local Wildlife Refuge or to inquire about a free Junior Duck Stamp program for your school, contact Jason Hunnicutt at jason_hunnicutt@fws.gov or by telephone at 843.527.8069. Open to public, private and home-schooled South Carolina students, participants compete in four grade groups (K-3, 4-6, 7-9, 10-12). 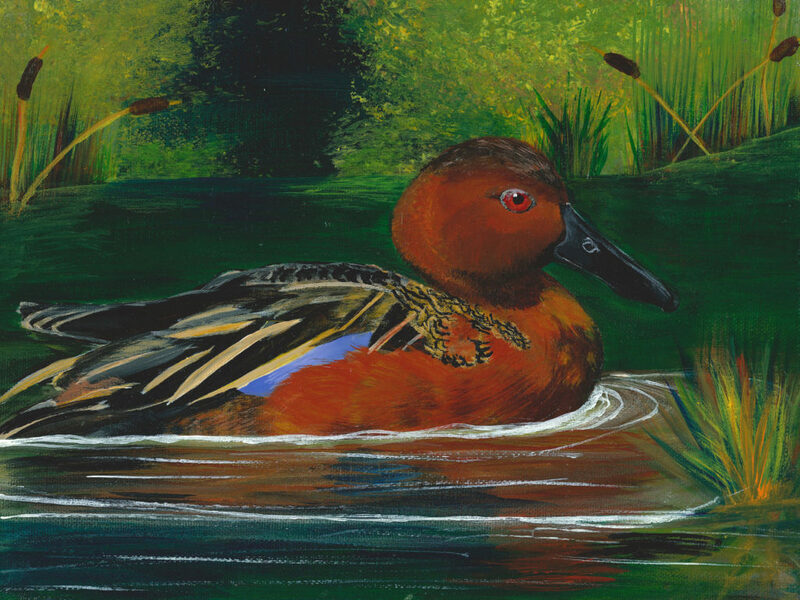 The overall South Carolina “Best of Show” competes in the National Junior Duck Stamp Contest. The winner will have his or her artwork turned into a postage stamp sold by the U.S. Postal Service and other vendors. Proceeds from the sales support environmental and conservation education efforts. The artwork of the winning students in the South Carolina Contest will be exhibited at several locations throughout the year, including the 36th Annual Southeastern Wildlife Exposition, held Downtown Charleston from Feb 16-18, 2018. For full contest rules, guidelines and requirements please download the 2019-2020 Contest Overview & Rules. The deadline for all entries is March 15, 2020. SEWE thanks our sponsor, Ducks Unlimited, and our partner SCDNR, who help to ensure the continuance of this important program. In 1989 the first Junior Duck Stamps were produced. Through an annual contest the designs are created by children artists and chosen, first on a state level, then on the Federal level. The winning design becomes the Junior Duck Stamp for that year. Like the Federal Duck Stamps, the Junior Duck Stamp is a pictorial revenue stamp and is sold for $5 each. Revenue generated by the sales of Junior Duck Stamps are used to fund environmental education programs in all 50 states, the District of Columbia, as well as two US territories: American Samoa and The Virgin Islands. Junior Duck Stamps can be purchased at National Wildlife Refuges and select post offices. The Junior Duck Stamp is not just another art contest. It is now the capstone of the US Fish & Wildlife service’s Junior Duck Stamp Environmental Education Program, teaching students “conservation through the arts.” With correlations to seven national curriculum standards indices, this program is an educational tool that spans across the classroom curriculum integrating language arts, math, science, and social studies, as well as art. At the same time children learn social and environmental responsibility towards wetland habitats and waterfowl conservation. Youth Guide – Federal Junior Duck Stamp Program *A supplement to the Educator Guide, this includes all the information and instructions learners will need to explore waterfowl and wetlands in their communities.